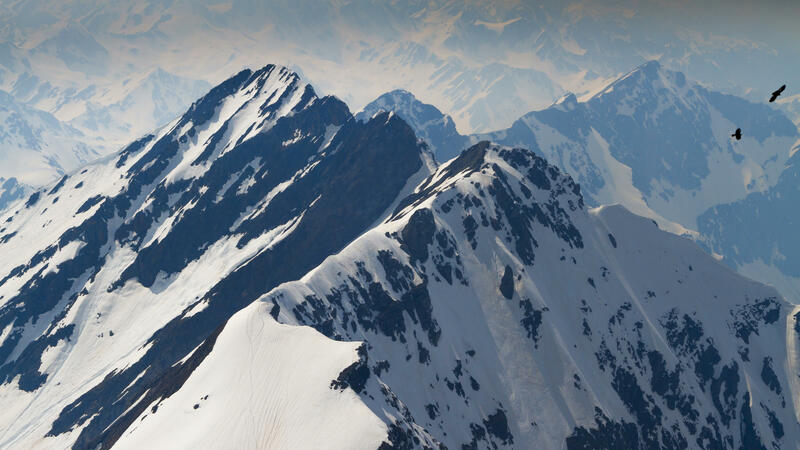 A team of researchers found a surprisingly large amount of microplastic in the air in the Pyrenees mountains in southern France. Surprisingly high amounts of microplastic are raining down on a remote and seemingly pristine part of France's Pyrenees mountains, according to scientists who say such particles could potentially be floating everywhere. Microplastic — fragments smaller than a fifth of an inch that have broken down from larger pieces of plastic — has been found in rivers, lakes, the oceans and in agricultural soil. But very few studies of wind-borne microplastic have ever been done. This one found that the air over these mountains has about as much floating plastic pollution as the air over Paris or Dongguan, a large industrial city in China. Steve Allen, a researcher at the University of Strathclyde in Scotland, was part of the team that dreamed up the Pyrenees experiment. "I don't know if you've ever seen a plastic bag on a fence flapping away until it disappears," he says. "Well, we thought that maybe it just doesn't disappear, so we started looking for it a bit higher up." Higher up meaning 4,500 feet up a mountain. Allen's team set up collectors there for five months to trap plastic particles as they fell to Earth. "We expected to find some," Allen says. "We didn't expect to find quite as much as we did." In fact, they found 365 plastic particles on average every day on a square meter collector. "We'd kind of expected it in a city getting blown around," he says, "but way up there? The number is astounding." Writing in the journal Nature Geoscience, the researchers found several types of microplastic floating on the wind in the Pyrenees: fibers from clothing, and bits from plastic bags, plastic film and packaging material. 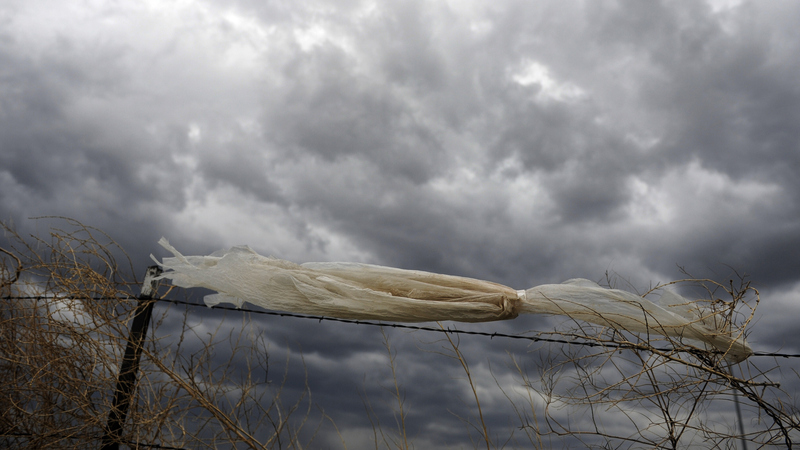 A plastic bag caught on a fence blows in the wind. Microplastic is formed from larger pieces of plastic that have broken down. And apparently, it isn't local. Only a few small villages lie within 60 miles of the study site. Scientists know how dust gets blown — say, from the Sahara across the Atlantic – but they "know basically nothing about how [microplastics] move," says Deonie Allen of the French institution EcoLab, who worked with Steve Allen on the research and is married to him. "We don't have this sort of material in nature," Deonie Allen says, noting that microplastics come in different shapes and are of different densities, which might affect how long they remain wind-borne. The researchers suspect that rain or snow carries some particles down to the ground, but they don't need precipitation to fall to earth. Allen says that if this much microplastic manages to get halfway up the Pyrenees mountains, it could theoretically be everywhere, floating hundreds of miles from its original source. And some microplastics probably can be inhaled. "We ...don't know what they do to humans," Allen says. "They're a brand new [type of] pollution, but there's so much of it and it's increasing so fast that it's something we really need to start learning about." Chelsea Rochman, a plastics researcher at the University of Toronto, has found microplastic as far away from civilization as the Arctic. She says this new study shows that "our use of plastic materials and the way we dispose of them has led to global contamination of more than just populated areas." In fact, she says, "plastic pollution may be the marker of our time." The mountain air over the Pyrenees of France should be about as pure as air can be, yet there's pollution even there. The air carries tiny plastic particles that have traveled with the wind, possibly from hundreds of miles away. Scientists who made this discovery suspect that microplastic could be floating everywhere. NPR's Christopher Joyce reports. CHRISTOPHER JOYCE, BYLINE: As plastic degrades, it doesn't just disappear. It breaks into tiny pieces. It ends up in the dust in our homes and in rivers and lakes and oceans. Steve Allen at the University of Strathclyde in Scotland wondered if it also goes up into the sky. STEVE ALLEN: I don't know if you've ever seen a plastic bag on a fence flapping away until it disappears. We thought that maybe it didn't just disappear, and we started to look for it a bit higher up. JOYCE: Four and a half thousand feet up a mountain in a remote part of the French Pyrenees, in fact. Allen's team set up collectors there for five months to trap plastic particles as they fell to earth. S ALLEN: We expected to find some. We didn't expect to find quite as much as we did. JOYCE: Three hundred and sixty five plastic particles fell on a square meter collector every day. Allen was surprised by that. S ALLEN: We kind of expected it to be in a city getting blown around, but way out there just was - the numbers was astounding. JOYCE: Writing in the journal Nature Geoscience, the researchers found several types of microplastic floating on the wind, fibers from clothing and bits from plastic bags, plastic film and packaging material. But they don't know where the particles come from geographically. DEONIE ALLEN: We know basically nothing about how they move. JOYCE: Allen's wife and co-researcher Deonie Allen, who works at a French research institution called EcoLab, says scientists do know how dust gets blown, say from the Sahara across the Atlantic. But very few people have studied windblown plastic yet. D ALLEN: We don't have this sort of material in nature. JOYCE: Apparently the plastic isn't local. Only a few small villages lie within the nearest 60 miles of the collection site. Yet the density of the microplastics collected in the mountains is comparable to that found over the megacities of Paris and Dongguan in China, where similar studies have been done. Deonie Allen says if this much microplastic manages to get halfway up the Pyrenees mountains, it could theoretically be everywhere. D ALLEN: We also don't know what they do to humans. We don't know how they form inside soils and how they move. They're a brand new pollution, but there's so much of it. And it's increasing so fast that it's something we really need to start learning about. JOYCE: Christopher Joyce, NPR News. Transcript provided by NPR, Copyright NPR.